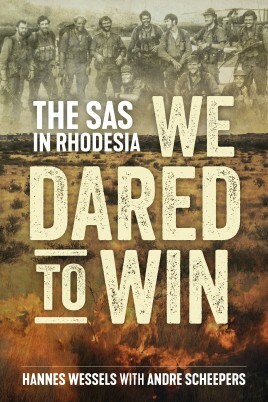 Action-packed account of a member of the celebrated Rhodesian SAS, who fought with incredible tenacity and ingenuity against overwhelming odds in the Rhodesian Bush War of the 1970s. Hannes Wessels was born in 1956 in Salisbury, Southern Rhodesia (now Harare, Zimbabwe) but grew up in Umtali on the Mozambican border. As a boy, holidays were spent with Game Department rangers; time on safari in Mozambique with the late Wally Johnson was a big influence on him. Wessels also grew to know Robert Ruark whose love of Africa, its people, politics and the written word left a lasting impression. He saw action in the Rhodesian bush war before acquiring a law degree which he chose not to use. He has hunted big game in Mozambique, Zimbabwe, Zambia and Tanzania in a 20-year career. In 1994 he was severely gored by a wounded buffalo which almost cost him his life. While no longer directly involved in hunting, he is part-owner of a lodge and game ranch in Zambia on the Zambezi and remains keenly interested in all matters relating to African wildlife and conservation. He has published Strange Tales from Africa in the USA, a collection of anecdotes from his hunting days. He is also a syndicated writer for Outdoor Life in the United States and is currently writing a history on the Rhodesian SAS. He is married to Mandy and has two daughters, Hope and Jana, and lives in Darling in the Western Cape of South Africa. After a childhood on a farm in the Rhodesian bush, Andre Scheepers joined the Rhodesian Light Infantry commandos, followed by the SAS in 1974. In the thick of the action during the Rhodesian Bush War he was wounded on 12 occasions. Turning down an opportunity to go into the British SAS, he elected instead to join a seminary and later became a priest. A true leader, beloved by his men, his calmness in extreme danger coupled with his ability to think his way out of tight corners made him the quintessential SAS officer.